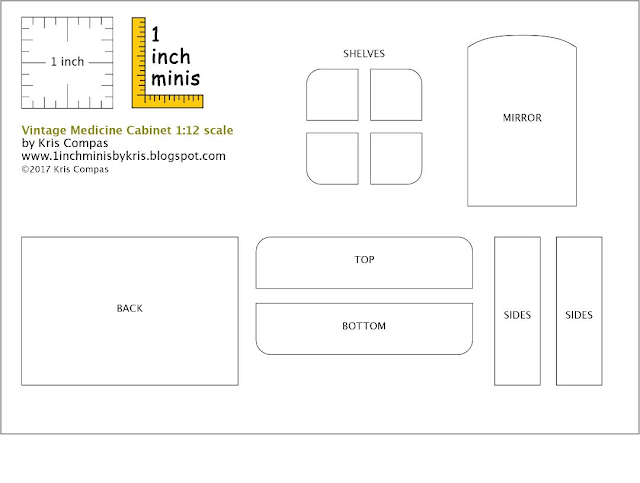 1 INCH SCALE VINTAGE MEDICINE CABINET - How to make a vintage medicine cabinet for your dollhouse from mat board. This is a picture of my medicine cabinet from the bathroom room box I made a number of years ago. It is a copy of one I actually have in my basement bathroom. My husband was a remodeler when he first started his business. He was also beginning to build what became our home. Al finished off the basement first. Sometimes homeowners he was remodeling for offered odds and ends that they were not keeping, Al would bring them home and put them back to use. The medicine cabinet is one of these odds and ends. The original was painted a horrid green, really and has some etching at the top of the mirror. I tried to replicate that with white paint on my first miniature of it. This is the second miniature, the one I will be showing how to make. Here are my drawings and measurements. Sometimes you have to change measurements when making a miniature. The full-size medicine cabinet was so small that I enlarged it's measurements so that I could make it. You can change the measurements to fit your needs, too. You will be tracing Nancy's patterns. Keep your pencil sharp to make a narrow line around the patterns. Cut the patterns out on your drawn line. These are Nancy's beautiful patterns. I would print them out onto card stock for tracing. At the left of the blog in the "Things to do, Things to see" list there are instructions for RE-SIZING THE PATTERNS. Nancy sent us a second pattern sheet for those of you that have the digital desk top cutters or scrap book cutter machines. This pattern has the mirror frame or you can copy the sheet onto card stock and use the 1/16 inch wide strips for your frame. Thank you Nancy for thinking of this! I am using yellow wood glue for the entire tutorial. This glue dries hard, not flexible like tacky glue. I don't want these joints to be flexible. Trace around the patterns onto 1 layer of mat board and cut out a back and the top and bottom pieces. Glue the top and bottom to the long edges of the back. I am gluing to the edge of the back, look closely at the picture. I am not gluing the top and bottom onto the surface of the back. The top and bottom are on. Measure and mark as in the picture 5/8" in from each side. Trace and cut out from 1 layer of mat board 2 sides. Glue the sides onto the back and the top and bottom on the marks you made. Trace and cut out 4 shelves from 1 layer of mat board. To help gluing the shelves in with even spacing I cut a spacer. Cut a strip of mat board 1/2" wide. Make a cut, not through, leave the paper uncut on the other side of the mat board. Lay the spacer into the corner of the side. Apply yellow wood glue to the edge of the shelf and press into place. Hold onto your shelf and carefully remove the spacer. Wipe of any excess glue on the spacer and place it under the shelf and glue in the next shelf. You can change the spacing of your shelves for your needs by changing the width of the spacer. The shelves are glued in. To cover the raw edges of the mat board I cut narrow strips of card stock. I just eyed this, I didn't measure. I cut a bunch to choose from. Glue the strips onto the edge of the shelves first. I then glued the strips onto the vertical edges of the sides and the front. Glue the strips onto the edges of the top and bottom last. I save packaging, you never know when you are going to need some shiny card board/card stock. I think this is also available in the scrap booking isle, with the paper and card stock if you don't have any old packaging. Turn this over to the wrong side and trace the mirror pattern onto it. Press some painters tape onto the mirrored side. My painters tape came off nicely without tearing the surface of my mirror. Press down on the edge you are going to paint against. The first time I was timid and didn't do that and paint got under the tape. I have about a 1/16" showing on each long side. I painted the first coat using brush strokes toward the edge of the mirror, not from the edge towards the center of the mirror. I thought this would insure that I would not get any paint under the tape and also seal the seam of the tape to the surface. I painted a second coat. After that was dry I peeled off the tape slowly and was pleased with the results. I placed tape on the bottom of the mirror and painted a line just like the sides. I painted the top curve free hand. 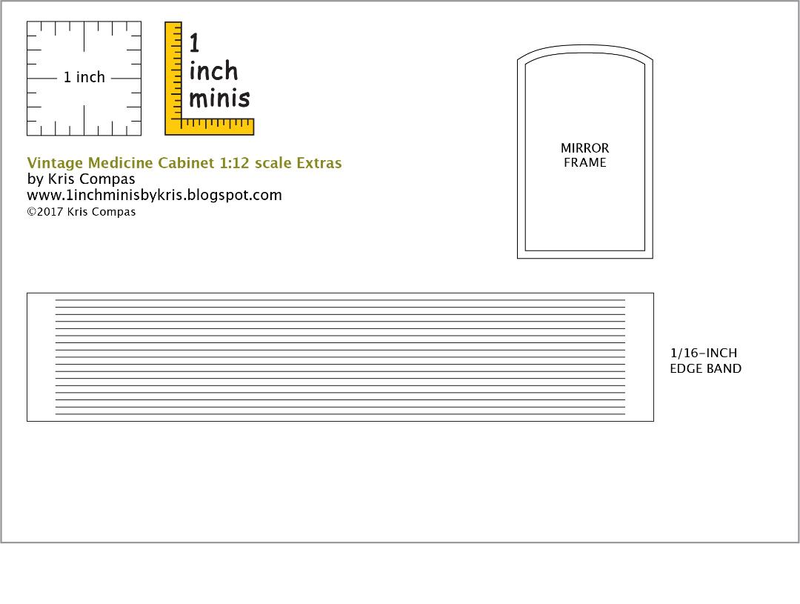 Glue the mirror onto the front of the cabinet. HAPPY NEW YEAR! I hope you all had a nice Christmas, too. This is a pretty short tutorial that would make a good club project, quick and easy. Thank you to all of you that wished me a Merry Christmas and recovery from my cold. I am better and looking forward to another year. I've put the "Lottie's Chair" that I made for a previous tutorial up for sale on the Etsy site. I will try to keep some upholstered furniture there from now on.